Basically, water moves through the earth dissolving minerals, holding them in solution as salts, consisting mainly of calcium and magnesium. Most of these salts eventually deposit themselves as scale in your pipes, water heaters and other appliances which use water. Scale build-up is the result of a natural crystallization process which is accelerated by heating. The energy loss of trying to heat water through scale is substantial. A one-half inch thick layer of scale in your water heater will retard heat transfer by up to 70%. When water passes through an intense and highly focused magnetic field, one of the positive changes to the water is a change in the surface tension. Generally speaking, the harder your water is the more difficult it is to create soap bubbles. The increase in the surface tension of the water caused by the magnets can greatly reduce the amount of soaps, detergents, and shampoo you use. For most people, this is the very first indication that the magnets are working after they have installed them in their home. The first time you shampoo your hair you'll notice a large increase in shampoo suds. Your first thought will be that you used too much shampoo. The odds are, you used about the same amount you always do but the treated water created far more soap bubbles. The magnetic water conditioning will have you reducing the amount of soaps, laundry detergent, and shampoo for the first few weeks as you adjust to this improved condition. The residential water conditioning system comes with two sets of magnets, each set consisting of two magnets. 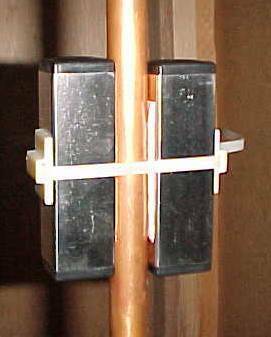 Two magnets clamp together on opposing sides of the cold water pipe and the other two magnets clamp together on opposing sides of the hot water pipe. This permits the magnetic field to penetrate the pipe. NOTE: The magnets may be installed on copper, pvc or plastic pipe. Do not use on steel or galvanized pipe. Install one set on the cold water pipe (see Installation below), after the water meter and before the hot water tank. Be sure magnets are installed after any grounding wire that may be attached to the cold water inlet pipe of the main waterline. Install one set on the hot water pipe where it leaves the water heater. 1. Remove the paper backing from the adhesive strip on each magnet. This adhesive strip will help hold the magnet in place for step 2 & 3. 2. Place one magnet on the water pipe as shown in the diagram above, then place the second magnet of the set on the opposing side of the pipe. 3. 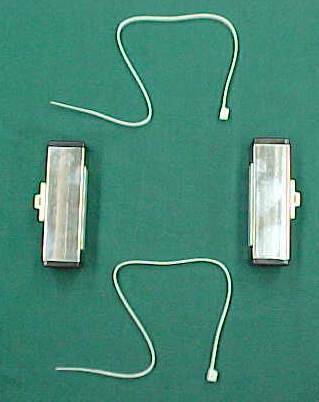 Using one of the supplied cable ties, feed the cable tie through the slot of one magnet, around the pipe and through the slot on the second magnet, then feed the end into the cable tie lock. 3. Tighten the cable tie ensuring the magnets have stayed in place opposite each other on the pipe. 4. If you placed the first sets of magnets on the cold water pipe, then now do the hot water pipe, or vice versa. 5. That's it, you're done. You are now ready to experience the free magnetic energy as it conditions your water. DO YOU OWN A RV? Water line magnets will make a world of difference in your recreational vehicle. Travelling around from place to place with no control over the water quality that enters your RV, you will immediately notice less spotting on your shower walls, dishes, cutlery and counter tops. Installation is the same as laid out above. 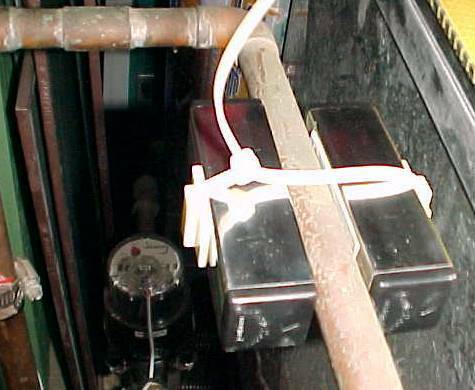 Place one set of magnets where the water line enters your RV and one set where the water exits the hot water heater. It's that simple. NOTE: Because of the constant shifting of an RV as it rolls down the road, the magnets may shift position. After using the cable ties in the photos above, wrap the magnets with duct tape to keep them in place. For the most part magnetic water conditioners are maintenance free. If you've been using hard water for a year or longer, you should follow these easy steps to clean up the hot water tank. After the magnetic conditioners have been in your home for 3 to 4 weeks it’s time to see what’s going on in the hot water tank. Take a short piece of garden hose around 4 feet in length and put it on the hose fitting at the bottom of your hot water tank. Place the end of the hose in a bucket and open the drain valve long enough to fill the bucket about halfway. In most cases you will be left with water that is either cloudy or has small pieces of calcium in it, or both. Follow this easy step every 3 to 4 weeks until the water is clear and there are no pieces of calcium. At this point the lime scale build up has been removed from the inside of your hot water tank, and you no longer have to do this. This process can take up to a year or more depending on the amount of build up that there is in the hot water tank and the level of hardness in the water. Two sets of magnets with two cable ties per set. One set for cold water pipe and one set for hot water pipe. Two sets of magnets, with cable ties, is $60.00USD*. Shipping anywhere in North America is $20.00USD. Shipments are Insured and Trackable. Single sets of magnets are available for $30.00USD* a set, cash payment. Local pick up in Regina is available to save on shipping. *Saskatchewan residents subject to 5% PST and 5% GST taxes. *All other Canadian residents subject to 5% GST. No taxes on orders shipped outside of Canada. 2. I installed the magnets and within three days we noticed a major difference in the taste of our water. Showering left a noticeable difference in our hair and skin. It truly is an excellent water conditioner. This product is well worth the minimal amount you pay for it. 3. I received my magnets late yesterday. My husband installed one magnet at the output pipe at the well, one on the output pipe of each water heater (2). This is going to be hard for ANYONE to believe, but during my morning shower earlier today, I thought that my soap lathered better and quicker, but really felt like it was my imagination - NOTHING could work THAT fast . . later, I hand washed a few dishes - same experience. Still, I'm thinking, "This is NOT possible." So I put it to an 'ultimate' test. I use a glass cooktop and have ceramic countertops. I keep plenty of distilled water on hand; otherwise I have streaks, streaks, and more streaks on these items. Well, I took a clean dishcloth from the drawer - wet it with water from my faucet.. .and VIOLA - I have shiny, clean cooktop and countertops with faucet water - absolutely NO streaks!!!! I have dealt with hard water for 30 years! My hubby and I were in the discussion of buying a water softener from a well-known manufacturer for mega-bucks when I read about magnetic water conditioning. It's certainly worth the effort and money!!!!! 4. My hands are very susceptible to dryness and cracking. If I wasn't using a water softener I had to continually coat my hands with lotion. We do a lot of rving and I don't have a water softener in our rv. Once my husband installed the magnets in our rv my hands were fine. I am very happy with these magnets. It's made a huge difference. So much so we discontinued using our water softener at home and installed these magnets in the house too. 5. As a single father of two young girls I do a lot of laundry. From the time I put the magnets on my water line I noticed I use a lot less detergent. This has to be beneficial to my daughters' skin. I no longer worry about getting all the detergent from their clothes as I hardly use any. Also, the clothes seem to come out brighter than before. 6. We had friends visit us on our acreage. They said "What did you do to your water?" I asked what she meant. She said on their previous visits there was always a smell to the water in the shower and now there is no smell. It took a second to realize we had installed the water line magnets a month earlier. We love them.